And now, a word from our sponsor … crammed awkwardly into the middle of the award show you're watching on TV. If you missed the latest mini-infomercial wedged between breathless acceptance speeches, then you weren't among the 6 million or so people watching Sunday night's 66th Tony Awards on CBS. Royal Caribbean slipped a big fat four-minute ad into the program, switching the action from New York's Beacon Theatre to one of its musical cruises, where singer-dancers did a couple of numbers from Hairspray. The marketer paid for the right to shill during the content, though it won't say how much. It's a trend that's on the upswing. Brand integration, especially during events people are likely to watch live, is increasing. Better get used to it, haters, and hope for a shred of relevancy. That the cruise line has a legitimate link to Broadway may not make its product placement less jarring, but it at least makes sense. There's a worse example: Last fall, Jennifer Lopez did a bump-and-grind during the American Music Awards on ABC and inexplicably brought along a Fiat 500. The subcompact car—J. Lo is a paid endorser—got nearly as much airtime as her bum did. Compared to that display, Royal Caribbean's in-show ad was seamless. 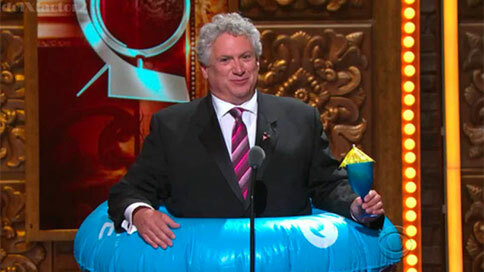 The biggest sin may have been making us look at Harvey Fierstein in pink swim trunks. Forgivable? Your call.